Winding through the lush valleys of Pennsylvania the Allegheny, Monongahela, and Ohio rivers flow. At their confluence is the city of three rivers: Pittsburgh. Long-dubbed "Steel City," Pittsburgh’s industrial landscape has evolved since the heyday of the steel mills. These days, Pittsburgh’s 1,600 technology firms are helping redefine the town, generating $20.7 billion in annual payrolls. Now, Pittsburgh is gradually growing to be a notable player in the cannabis research space, as well. On April 17, 2016, Pennsylvania’s governor signed a medical marijuana program into law, making it the 24th state permitting medical cannabis distribution. Part of the law includes a publicly funded, state-run research program to study marijuana’s effectiveness in treating 17 medical conditions. The Pittsburgh School of Medicine researched and announced that male subjects who consumed cannabis between the ages of 15 and 26 were “not at a heightened risk for maladjustment in adulthood,” dispelling a long-held myth. Another University of Pittsburgh study was first to assert that smoking marijuana has little or no adverse health effects. 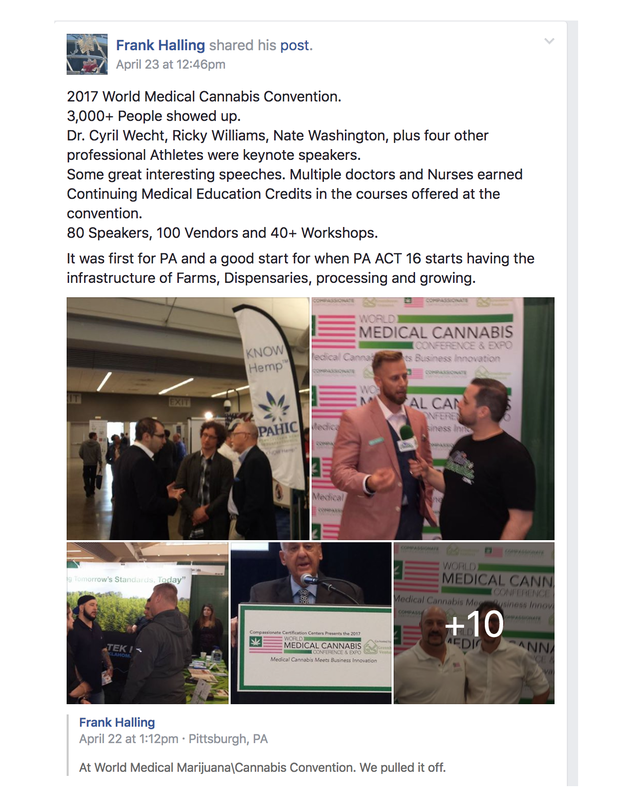 It was fitting, then, that the World Medical Cannabis Conference and Expo (WMCCE) was held in the city of Pittsburgh the 21st and 22nd of April. With fewer pot leaves but more MDs, the conference delivered a refreshing perspective of the cannabis plant. Recreational users sometimes forget that cannabis heals - which was WMCCE’s uniform theme. What happened in Pittsburgh this April weekend was a wave of other doctors congregating to further peel away at the marijuana's stigma to see what lies beneath. They found miracles. Every triumph over disease is universally glorious but is even more powerfully affecting when those afflicted are children and their families are sitting right in front of you. On stage at WMCCE were three real-life, unique and compelling cases of miraculous results through cannabis CBD treatment. At seven weeks old, Lillyann Baker suffered a traumatic brain injury that progressed into severe epilepsy. Her days were filled with seizures. “She'd have maybe an hour break, then go right back into another one," her mother Cassandra Stephan explained. Epilepsy is not one specific disease, but rather a group of symptoms that are manifestations of any number of conditions involving over stimulation of nerve cells of the brain. A cell signaling activity affects the nervous system and causes muscle spasms. Prescription drugs like Eslicarbazepine (Aptiom), Felbamate (Felbatol), Carbamazepine (Carbatrol or Tegretol) are typically used to treat these conditions but don’t always work. That was certainly true for Lillyann. Seizure medicines had no effect on her, so after lots of research and consideration, her mom tried a high concentration hemp oil instead. It took six months and five different types of hemp oils, but Lillyann finally had the reaction the family wanted with the discovery of Real Scientific Hemp Oil™ (RHSO) CBD concentrates produced by HempMeds. “The electric properties of hemp are responsible for seizure reduction,” HempMeds CEO Dr. Stuart Titus told me in our interview. As of February 2017, Lillyann will be seizure-free for an entire year. Harper Howard was born with a rare genetic disorder called CDKL5 which causes uncontrollable seizures -- 40, or more, per day. Again, conventional medicine didn't work for Harper, who at one point was taking with a combination of 10 medicines. Penny Howard, Harper's mom, sought other solutions. Things changed for Harper in 2013 when Dr. Gupta broadcast his aforementioned cannabis series. There they were. Penny saw stories of children like her Harper successfully treated with cannabis CBD. She found RHSO and saw results after two weeks. The CBD treatment eliminated Harper's seizures and gave her and her family an entirely different quality of life. Harper died in January 2016, but her legacy lives on. Her family has donated her organs to medical research. Today Harper's cells are being used to test the effectiveness of treatments for autism and CDKL5. "Harper has taken on a new form," her mother told the attentive conference audience. "We're all just parents, searching for a better quality of life for our children. Cannabis is an option. Hemp is an option." Sitting across from Raul Elizalde, I quickly learned I was in the company of a Mexican national hero. His daughter Grace was born with a rare condition called Lennox Gastaut Syndrome (LGS), a rare and often debilitating form of childhood-onset epilepsy. LGS is characterized by a triad of signs including multiple seizure types and moderate to severe cognitive impairment. It is among the most difficult forms of epilepsy to treat. With Grace suffering nearly 400 seizures a day, Elizalde and his physician tried 19 medicines and even brain surgery to contain the seizures. Having that many seizures a day is not living a life, Raul told me. Once again, nothing worked to treat the condition until RHSO CBD. But in Mexico, cannabis CBD is illegal. So, accompanied by his physician, Elizalde sued the Mexican government for the rights to use the plant extract. Six months later, he'd won. The case became a watershed moment for cannabis advocates, spurring Mexican President Enrique Pena Nieto to reverse his long-standing position on cannabis legalization. The Mexican government went on to begin granting permits allowing other patients to import medicinal marijuana products, and also decriminalized possession of small amounts of marijuana. The domino Elizalde knocked through another milestone on April 28th, 2017 as the lower house of the Mexican Parliament (by a margin on 374-7) passed a bill permitting growing marijuana for medicinal or scientific purposes. "It is immoral not to give something to a patient that can help them heal," Elizalde told me. Indeed, it's a disservice to the advancement of science, as well, and the World Medical Cannabis Conference and Expo did a fine job of reinforcing that point.